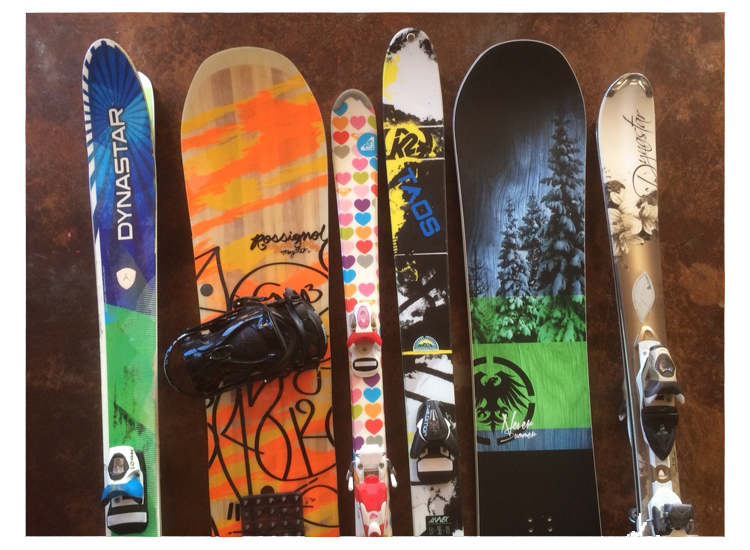 Getting a good tune on your skis or snowboard at the beginning of the season or before a vacation is a good idea, particularly if your equipment got knocked around in the garage or the edges got rusty over the summer. When getting a tune, here are some things to keep in mind. If every day were a powder day, we wouldn’t have to think about the angles of the edges of our skis and snowboards. Unless you’ve got enough cash for an Alaskan heli trip, or even more for your own helicopter, you’re going to get more hard-packed conditions than powder. So, it’s good to have a little knowledge about tuning and edges. Edge angles, commonly referred to as bevels, can get confusing and a basic understanding of geometry helps. Having the most comfortable and effective edge angle for the type of skier or boarder you are and where you like to go can affect your day on the mountain. With rare exceptions, the bevel on base edges are 1°. The side edge bevels are what change the way a ski or board handles. A greater side edge bevel creates a more acute angle, which offers firmer edge hold. Most manufacturers set their side bevels on new skis at 1° or 2°. Racers may tune theirs theirs to 3° to 5° or more, depending on the discipline or conditions. A ski or board with a “neutral” 1° side bevel is better for beginner skiers. This tune performs comfortably in most snow conditions, the exceptions being very hard or icy snow. A 2° side bevel creates a “standard” bevel. As the name implies, this is the most common and it’s good in the greatest number of situations. This is what you will most likely get from a shop tune. No quality tuning shop will put on a 3° or more (“advanced” ) side edge bevel or change the base edge if you don’t ask for it. Unless you’re racing, in which case you probably know what you like, here are some typical bevels for different types of skiers and boarders based on a 1° base bevel. These are generalizations, of course. Over time, the base of skis and boards loose their structure. When a base is completely smooth, it doesn’t glide as well. It needs some grooves, similar to tire treads, to reduce friction. Typically, the way to give the base a new structure is to run it through a large stone grinding machine. You wouldn’t need to read this if you have your own machine, so you need to go to a shop for this. Base structure holds up longer than edges and therefor isn’t required as often. A shop will most often use an all temperature wax when giving your skis or board a tune. You can usually get away with this in typical winter conditions. In spring, however, warm snow wax can make a big difference. You may have to ask for it, and surprisingly, many shops don’t offer it. If you’re going to do it yourself, you have many choices, even for the same snow conditions. High fluoro, low fluoro, graphite, additives. Making a decision can be difficult, and some wax is shockingly expensive. The basic rule is pair the color with the temperature of the snow. For cold snow, anything under 18°, blue is your color. Red is for snow that’s 25° to 18° F. Yellow is for warm, spring snow at temperatures above 25° F.
A good tune with edge, wax and base restructuring is a good investment, even at $50 or more. Will you have a more fun with a well-tuned board or skis? Maybe not, but it will help you ski better while you’re having it. Information brought to you by the Edelweiss Lodge and Spa – Luxury Vacation Condos in the Taos Ski Valley. This entry was posted in tuning skis and snowboards. Bookmark the permalink.